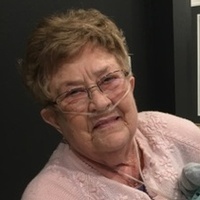 Billie D. Welshofer, age 88, Joplin, passed away on Friday, December 15, 2017 at Joplin Gardens. Billie was born April 6, 1929 in Joplin, daughter of the late Claude Smith and Beulah Hughes Smith. She graduated from Joplin High School, and worked as a manager for Consumer’s in the bakery, and also with Ethel Barclay Wedding Apparel for several years. She was a member of St. Mary Catholic Church, and was also a member of the Jasper County Extension Club. Billie loved to fish and camp with her family at Bear’s Den in Grove, Oklahoma on Grand Lake. In addition to her parents, Billie was preceded in death by her husband of over 40 years, Martin Welshofer who died September 11, 2016, a son, Joe Wasson, and a step-son, Tom Welshofer. Survivors include her son, Michael Wasson of Port Orange, Florida; stepchildren, John Welshofer, Peter Welshofer, Patrick Welshofer, Judy Dennis, Leslie Dyce, and Carol Pippin; daughter-in-law, Terry Wasson of Carl Junction, Missouri; 19 grandchildren and 14 great-grandchildren. Graveside services will be Tuesday, December 19, 2017 at 10:00 a.m. at Ozark Memorial Park Cemetery. The family will receive friends at Parker Mortuary on Monday from 6;00 to 7:00 p.m.